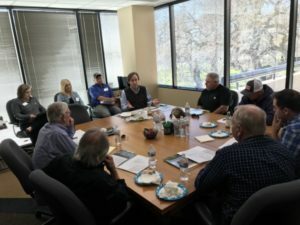 In order to keep the lines of communication open between the Conservancy and its tenant farmers, the Conservancy recently completed its 2018 meeting with growers. The key topics for the meeting included compliance with water quality regulations, Covered Species identification and reporting and new lease structure and format for 2019. Conservancy tenant farmers are required to comply with the Natomas Basin Habitat Conservation Plan (NBHCP). This includes farming in ways that maximize the benefit of the farm for the benefit of the NBHCP’s “Covered Species,” including the Swainson’s hawk and Giant garter snake among others. A number of crops are grown on a certain portion of Conservancy mitigation land. By far the largest is rice, which is dedicated mostly to providing mitigation for the Giant garter snake. Also produced is alfalfa, squash, onions, safflower, sunflower, milo and various non-rice grains (oats, rye, barley, etc.). A limited amount of cattle grazing also supports agricultural diversity on Conservancy mitigation land.